Today, Google Maps announced a new feature called Your Timeline. 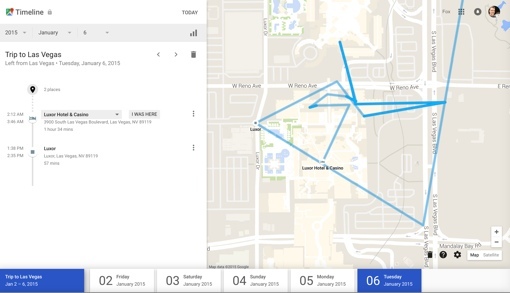 It’s a visual collection of all the physical locations you’ve visited over the last several years – and a way to review all the GPS data Google has stored on you. Most of the data in Your Timeline is collected by Google applications on your smartphone. This means that Android users will tend have a more robust data set. Still, as an iPhone owner, my own timeline has plenty of data from Google Maps sessions and travel bookings. I can personally review my 2015 trip to CES in Las Vegas, my numerous 2013 visits to my friends in Philadelphia and more. Your Timeline even makes note of what businesses and restaurants you’ve visited – I had completely forgotten I visited a local pub until I saw the red locator dot on Google Maps. Thankfully, only you can view your Google Timeline. Google also gives you control over which data points to keep and which to delete – even if that means you want to delete the whole cache. You can also edit information if you want, assigning your own private names to frequently visited locations (i.e., Aunt Freida’s House). Having this sort of information stored on the Internet can be a bit unsettling, but it does enable access to a lot of useful services. Google Now uses location tracking to automatically provide real-time traffic alerts before you leave for work in the morning and before you leave for home in the afternoon. Your GPS history information is pretty useful in helping you figure out where you parked, too.